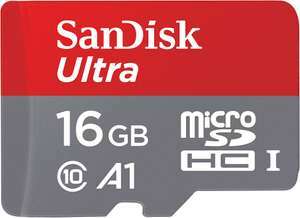 Purchasing for expanded storage for the Fire HD tablets and this was the best price on 16GB class 10 98mb/s card I could find. As I needed 4 and it wouldnt break the bank I got these. True, but not everyone and that includes me is in the need for 32GB. Good price though. Thanks OP. Great find. Been looking for 1 of these this last week. Out of stock, could have done with one of these, doh! Ordered the 32GB version. Thanks OP. This will work in a Fire HD 8"? Why not just try Googling something like "Fire HD 8 micro SD card"? You'd probably get an answer instantly. Spot on find at this price, I wanted one for a camera on the second bike. They have the 48mb/s ones for 40p cheaper if you prefer that one? Had two of these fail (all be it a two 32gb) both were genuine. Why are these so expensive now? I remember buying 2 x 32gb Sandisk class 10's for £15 a couple of years ago. Is it brexit? Got myself 2x 32GBs to use with my DJI Spark for a 3 week holiday at the end of the month. Trick question. Would this work for Apple iPhone? You're talking absolute rubbish, you haven't posted any link just mentioned that it's 'cheaper at Tesco'. Why don't you post that deal instead of moaning about this one? You're talking absolute rubbish, you haven't posted any link just …You're talking absolute rubbish, you haven't posted any link just mentioned that it's 'cheaper at Tesco'. Why don't you post that deal instead of moaning about this one? 1st - its already posted so why would i post it again? edit: mods - great moderation deleting my comment but allowing a random lazy guy to attack me from it - its still there in quote form - not difficult to either remove all or leave all! wow ...1st - its already posted so why would i post it again?2nd - you …wow ...1st - its already posted so why would i post it again?2nd - you obviously didn't search and just want spoonfededit: mods - great moderation deleting my comment but allowing a random lazy guy to attack me from it - its still there in quote form - not difficult to either remove all or leave all! Where you replying to my comment "Where's the £11 one? Actually you attacked me first for not being able to read, when I was just trying to help another user. The fact that you never actually wrote what or where the other deal was didn't occur to you? Clearly the mods agree with me. The Toshiba deal which I can only assume you're talking about is no longer £10.99 anyway. Is that why you refuse to give us a link? Actually you attacked me first for not being able to read, when I was just …Actually you attacked me first for not being able to read, when I was just trying to help another user. The fact that you never actually wrote what or where the other deal was didn't occur to you? Clearly the mods agree with me. The Toshiba deal which I can only assume you're talking about is no longer £10.99 anyway, so the deal I linked was and is better. it still says in my comment above where the 32gb version of this card is cheaper - but naturally you can read eh? it still says in my comment above where the 32gb version of this card is …it still says in my comment above where the 32gb version of this card is cheaper - but naturally you can read eh? So you're talking about Tesco, which I already mentioned that you had said. My point is that the deal which you so sarcastically alluded to does not exist. All you have to do to prove us otherwise is post a link. So you're talking about Tesco, which I already mentioned that you had …So you're talking about Tesco, which I already mentioned that you had said. My point is that the deal which you so sarcastically alluded to does not exist. All you have to do to prove us otherwise is post a link. You've been here long enough (almost as long as me) to know how this website works. You post links to deals. What are you trying to achieve? You've been here long enough (almost as long as me) to know how this …You've been here long enough (almost as long as me) to know how this website works. You post links to deals. What are you trying to achieve?